Sharknado 3, for serious, is going to be subtitled Oh Hell No, as though the entire film was a guest on the Jerry Springer Show that just found out its husband was actually a woman and had been sleeping with its dad. Its dad being Sharknado 2: The Second One. Springer actually has a cameo in the third film, by the by. We're disappointed the writers didn't go with any of our pitches, but we'll make do. The thing that's kind of awesome about the Sharknado movies is that they are freakishly popular despite, or perhaps as a result of, reveling in low production values, cameos by whoever happened to be wandering the halls of 30 Rock, and absurd set pieces. 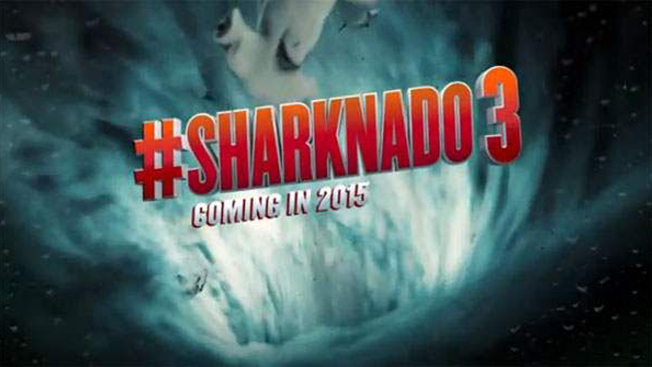 Fun fact: We actually talked to Ian Ziering about the scenes in Sharknado 2 where (spoiler!) he carves up airborne sharks with his chainsaw hand. He said he basically grimaces and poses dramatically in front of a green screen and they add the blood-spurting sharks in post production. Sharknado 2 got a 1.6 rating when it premiered and does reliably well in reruns, too—it's the network's equivalent of comfort food. The network's stable of homemade and acquired schlock movies accounts for an incredible amount of viewership—fully 2 percent of all 18-49-year-old eyeballs watching general entertainment cable were glued to movies on Syfy. That comes out to a little under 41 million gross ratings point, according to MoffettNathanson, which did some serious yeoman's work last week breaking down where exactly viewers were actually tuning in. Oh Hell No will star series veterans Ziering and Tara Reid. And Cassie Scerbo, who was in the first film, will return as Nova. The movie will debut on Syfy on July 22, just after Comic-Con International: San Diego. Nova's parents, obviously, will be David Hasselhoff and Bo Derek.